maybe you have to build that in the TX. Also I'd like to find more videos on what it takes to build a plane electronically that is. Power, esc/bec servos, etc. Any direction and help would be appreciated. I think that you need to tell a lot more if you want help. Is you plane without servos, motors and all? What is the size of the plane? Do you have any link to the plane? Did you search for DX8 configuration SPM files? There is a large library for download from Horizon Hobby. 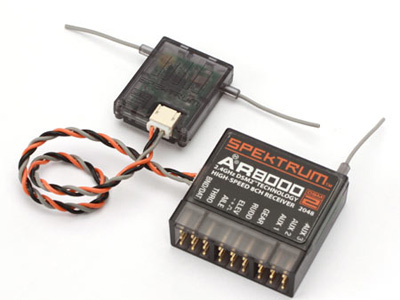 There are lots of config filen for download from the Spektrum site but you will also need descriptions on how to connect the servos and esc:s.
I have a DX8 and I can probably help you out but I need more information. Pictures would really help. How many servos are you using for each function? Are you using separate servos for the thrust vectoring or are you using linkages to connect them? Are you going to try to y the thrust servos into the control servos or do you want them on separate channels? Again, the more pictures and info you can give us to start with the easier this will be. What you are most likely going to have to do is set up the plane like you didn't have thrust vectoring and then using the mixes, blend the thrust vectoring into the controls. That way you can set the end points and blend in the ratios. Sorry about that.... and your help is appreciated for sure. I tried to bind the ar8000 tx/rx but I don't see a cable marked "esc" only one that states "5V". I connected main cables... throttle, rudder, ail, gear etc. Connected battery to main feed Dean connector. I get a few musical notes, beeps every 2 seconds or so. no power to rx - no lights of any kind. Plane was ARF type. hard to see inside jet for wiring. The ESC is to the throttle input on the receiver. - Put the bind plug into the Receiver before you connect the battery. Press the bind/trainer button on the transmitter and keep it pressed when you start the transmitter. Keep the bind button pressed all time when binding until the transmitter reboots. 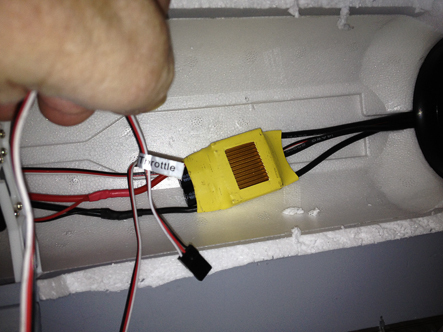 Remove the bind plug from the receiver before you disconnect the battery from the plane. The vector seems to be a simple mix. Rates are normally 100 or -100 and sw n, offset normally not needed. Are you rookie or just new with the electric? 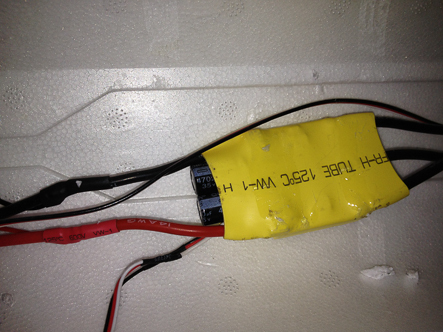 I would use an old type rx battery and not connect the esc until i have got all rudders and mixes programmed . It is not fun to get the EDF running without warning when you are playing with the settings. I am new with rc and rc electrics. I'm a telecom engr by trade. Esc is the issue..... There is none...... Or I cannot find it. I cannot pop selinoids to look where retracts are. I need to get f16 open to look. There has to be an esc to power the motor unless there's a combo receiver/esc unit or something. I'm assuming you've already pulled out the old receiver right? The old wire for the throttle was going to your esc, just plug that same wire into the throttle port on the new rx. When you plug in the battery, the only plug that will have any power to it is the one from the esc since it's built in bec powers the radio gear. 3-wire cable to the receiver throttle channel. The speed controller should be assembled in your plane. This is a new plane that I had to provide tx/rx and battery. Rest of electrics were already installed. Egerts - your esc / spectrum photos are appreciated. My other 3 planes work fine using the same gear in photos. Don't know why this F16 is a pain. When I have all leads connected to correct positions on ar8000, I have 2 leads left. One is main battery. The other is a +5volt output battery lead with a connector with black/red wires, small enough to connect to the rx. When I connect main power to dean connector, I get musical tones and then a series of beeps that seem to be in 2 second intervals. Thats all it does. No power reaches the rx. If I plug 5+volt output lead to rx in aux position, ar8000 flashes then goes out. Tones are the same. I don't even touch tx which is off. I know this is a pain....I'm going to have to pop open the body somehow and see whats going on. Tones indicates that the esc has power from the battery and that the motor is connected to the ESC. The tones shall go out when the receiver gives the correct zero level to the esc. 1 - the receiver must be bound to the transmitter - explained above. 2 - the throttle has to be at zero for the esc to stop beeping. Your extra lead - could it be the balance lead from the battery? Looking at the BH link does not show exactly - but there seems to be an option with an ESC with external BEC. In that case there will be one lead going to the throttle input on the rec and the other lead going to the bat-bind input. Sad to say I had to cut open the f16. what I found out the throttle cable is connected to the esc. The +5volt output cable is spliced to the positive and negative sides. I also notice that when power is energized, and after the tones, the fan moves slightly with each 2 sec beep. I will try to bind again with 1 lead going to connect throttle/esc to throttle and +5volt lead to bat-bind and see what happens. Time for a shot of Jack! Place the bind plug into the bind port then put the throttle plug in any port just to power the receiver. Then go through the bind process on the radio and you should have the radio bound. Then worry about getting the wires in the right ports. Remember that you also have to bind the satellite receiver if you are using one. .. Remember that you also have to bind the satellite receiver if you are using one. And the telemetry module if you are using it. Well I popped opened the F16 and found out the whole bec connection was missing. Sent info to hobby shop support and see where this goes. Will bind when I can including telemetry. Will need to find out about satellite. There isn't a separate bec connection, the connection that drives the esc is what powers the receiver. Unless yours is set up with a separate bec then you should only have to plug in the throttle connection and everything should power up. When you said the 5volt supply is spliced into the positive and negative, are you talking about the main flight battery positive and negative or are they running inside to the esc board?